In response to a growing media furore, Sinn Fein leader Gerry Adams has insisted that the Provisional IRA were not involved in the killing of Kevin McGuigan in east Belfast earlier this month. Mr McGuigan was shot dead on August 12th outside his home in the Short Strand area. He had been the main suspect in the murder of former Provisional IRA commander Jock Davison in May. He also allegedly had connections to criminal families in the Short Strand and Markets area who had repeatedly clashed with the PIRA. On Thursday, the PSNI blamed the killing of McGuigan on a self-styled vigilante group known as ‘Action Against Drugs’ (AAD). In a carefully worded statement, they said they believe some members of the group are, or were, members of the Provisional IRA. Crucially, however, they added that AAD was a separate organisation. Earlier this week, much media speculation focussed on the current activities of the Provisional IRA membership and to what extent that organisation may remain intact. The AAD group told journalists earlier this month that some of its members were former PIRA Volunteers. It openly threatened to kill those involved in the murder of Davison, and also claimed past vigilante attacks, such the killing of alleged drug dealer Danny McKay in Newtownabbey three years ago. More than ten years ago, McGuigan was himself accused of ‘anti-social activity’ and suffered a punishment attack as a consequence -- even though he was once a member of the PIRA alongside Davison. Following Davison’s murder, he was described by the police as having been a key “witness”. Most media speculation has focussed on the theory that the killing of McGuigan was an act of ‘revenge’ or ‘reprisal’ by Davison’s former comrades, and directed not only against the father of nine, but the criminal families he was alleged to have colluded with -- and, by extension, any other groups who might have been considering using violence against ‘mainstream republicans’. Of the ten who were questioned by the PSNI in connection with the murder, eight have been released unconditionally. One west Belfast man remains in custody after being charged with possession of a weapon, although not the weapon used in the killing. Prominent former prisoner Sean Kelly, a ‘mainstream republican’, was one of those arrested and released. He was in Donegal on holiday at the time of the killing with his family and is reported to be seeking compensation for wrongful arrest and detention. Sinn Fein’s political opponents north and south of the border have been keen to apply pressure on the party. Gerry Adams condemned those who have “opportunistically and cynically seized on the killing of Kevin McGuigan in a deliberate effort to undermine Sinn Fein’s mandate . . . and the peace process”. Mr Adams said those involved “are criminals who do not represent republicanism”. “The IRA were not involved,” Mr Adams declared, and criticised “speculation and media spin” about the killing. Earlier this week, DUP leader and First Minister Peter Robinson said he would be seeking the possible exclusion of Sinn Fein from the five-party administration. Robinson is facing a major scandal in his own right, with rumours that further details of his involvement in an allegedly corrupt multi-billion pound property deal are forthcoming. British Direct Ruler Theresa Villiers described the developments as “serious” but adopted a wait-and-see approach. She that “it is vital that the police are able to get on and pursue their lines of enquiry”. There was a similar tone from 26 County Minister for Justice Frances Fitzgerald who said the killing “must be condemned by all right-thinking people”, and that “speculation” was unhelpful. But Ulster Unionists were more dramatic, with Policing Board member Ross Hussey insisting that Mr McGuigan’s killing proved that the Provisional IRA still existed and “still has the ability to act with lethal effect”. Mr Hussey claimed there were PIRA training camps in County Tyrone and that large portions of their arms had never been decommissioned. This month saw the tenth anniversary of the PIRA statement announcing that the organisation was “standing down” and that its weaponry had been “put beyond use”. While the Provisional IRA’s promised disarming was verified by an independent body, it has been claimed that some handguns were retained by some Provisionals for “personal protection and area defence”. 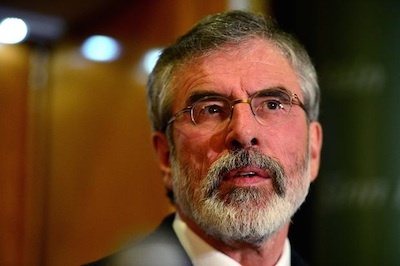 The following is the full statement by Gerry Adams on the matter. “The killing of Kevin McGuigan was wrong and those who were involved in it are criminals who do not represent republicanism. The so-called group Action against Drugs is a criminal gang. It is a mix of criminals and former republicans who have engaged in intimidation and violence in pursuit of their criminal ends. “My thoughts are with the McGuigan family. Anyone with any information on this brutal murder should bring it forward to the PSNI. “So too should anyone with information on the killing of Jock Davison. “There has been a lot of speculation and media spin about whether the IRA was involved in the killing of Kevin McGuigan. “The IRA was not involved. “In July 2005 the IRA left the stage. Its leadership ordered an end to the armed campaign; its representatives to ‘engage with the IICD to complete the process to verifiably put its arms beyond use’ and instructed its volunteers to take part only in ‘purely political and democratic programmes’ and no ‘other activities whatsoever’. “All of this was done as part of a genuine initiative to build a just and lasting peace and in support of the full implementation of the Good Friday Agreement. “Those who threaten to take action against Sinn Fein in the Assembly and Executive have no basis whatsoever for this. Sinn Fein’s mandate and the rights and entitlements of our electorate deserve exactly the same respect and protection as anyone else’s’.